Get a fresh and summery look with our range of light and bright summer dresses. 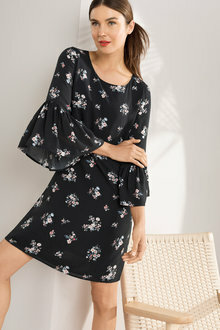 Whether you are off to a barbecue with friends, touring the seaside on vacation, or need a dress to wear poolside, EziBuy's extensive collection of dresses are sure to impress. Browse our gorgeous selection, from floral A-lines to vibrant maxi dresses. The sky is blue, the water is shimmering, and the warm weather is complimented by a cool breeze. It's the perfect time to break out a gorgeous summer dress. Whether you are off to a barbecue with friends, enjoying lunch with the family, or having fun in the sun by the sea, a summery dress is a must for the warmer weather. At EziBuy, you can find a range of dresses for every occasion, from casual dresses to glamourous evening dresses. Transforming your day dress into an outfit suitable for a night out is easy by switching from comfy sandals to gorgeous heels. Browse our collection of shoes perfect for dressing up your summery dress today!